Harvard Computing offers a variety of training options for you and your organization. Using TaskMap® is simple, but there are a few concepts that you need to grasp if you have never built a process map. TaskMap® training programs will help you get rolling. With courses running 3 times a week, it is easy to schedule your time, just call or email your request any time up to 2 hours before the course starts. 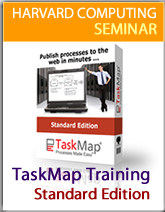 The TaskMap® training course consists of a live web presentation run by a TaskMap® expert from Harvard Computing. All you need is a high speed internet connection and a telephone to dial into the course number provided. An on-demand course is now available 24/7. Simply press the on-demand button on the right to start learning now. TaskMap provides a concise stencil of intelligent Visio shapes that allows you to document any process. You will learn the purpose of each shape and discover how to apply them to create an accurate reflection of your current or proposed work processes. In addition, TaskMap includes a toolbar that allows you to tailor each TaskMap to your specific requirements and those of your organization. Courses are limited to 10 attendees to maintain a more effective learning environment. © 1994-2016 Harvard Computing Group, Inc. All Rights Reserved. TaskMap is a registered TradeMark of Harvard Computing Group.